For a novella that blends the distant past and the near future, look no further than the highly imaginative Swords of Ansgar: A Windflower Saga by Aleksandra Layland. Sixteen-year-old Keridwen Rose (“Keri Rose”), daughter of Lady Kimberlee of Ansgar and her husband, Iolyn, is one of six children who has a special affinity for sword practice with the Helvellyn sword and has been training with her mother. The course of her young life drastically changes when she meets Lubomir (“Lubo”), a handsome sword master, who has come to Kimbria with the Blade Master of Helvellyn Island, his son, and another sword master to sell swords, give sword demonstrations and to find students for their swordsmanship school at Helvellyn. Widower Lubo is impressed by Keri Rose’s skill with the sword and extends an invitation to her to come to Helvellyn for sword training – as his wife. Seeing no other way to get the training she desires, Keri Rose reluctantly agrees but it isn’t until they’re on a ship and attacked by pirates that Keri Rose realizes that she’s fallen in love with her handsome Lubo. Fast forward centuries later… Twenty-six-year-old Mistress Kimbria Ke’ilani (“Kimmy”), the single daughter of Queen Ronven Korelani of Kimbria and a world champion athlete, has finished her competitions at the International Games and is out past curfew with Master Daren Haraldur, a 36-year-old widower. Having finished dinner, Master Daren informs Kimmy that he has chosen her, with his mother’s approval, to come to Helvellyn Island to train in the Way of the Sword and eventually become his mother’s replacement since Kimmy’s so-many-times-great-grandaunt Keridwen Rose of Ansgar had been the first woman training master at their school. Master Daren tells Kimmy that his mother has also approved of her on another level – as his future wife. Clearly, the two stories in Swords of Ansgar are set centuries apart. What ties them together are many strands of the familial dynasty and the love that both of the female protagonists have for swordsmanship and the Helvellyn sword. Each story is rich in history and in detail. Layland has created this multi-faceted family dynasty that spans centuries and the author takes the time to reacquaint returning readers with the family history as well as lay the basic groundwork for new readers so that they’re soon up to speed with who’s who in the story and how each of the key characters relates to the others. Keri Rose’s story is especially poignant and the relationship between her and her large family is touching, to say the least. Layland chooses her words effectively, giving readers a narrative that is detailed, with transitions between narrative and dialogue flowing seamlessly. The sweet and somewhat innocent love stories are juxtaposed by the threats of danger, giving both stories substance. Like a beautiful tapestry, Swords of Ansgar weaves two beautiful tales into one. Succinct and poignant, Swords of Ansgar (A Windflower Saga Novella) by Aleksandra Layland features two protagonists who aren’t mentioned in the novels of the Windflower Saga series. The first part of the novella follows the life of Keridwen Rose of Ansgar, called Keri Rose by her family, one of the daughters of Kimberlee of Ansgar and Iolyn. The second part tells the story of Kimbria ‘Kimmy’ Ke’ilani, an Ansgar descendant and the daughter of Queen Ronwen Korelani. These two protagonists are separated by time, but connected through bloodline and Ansgar’s love of the Helvellyn sword and its unique style of swordsmanship. Some authors tread the line between young adults and adult readers, therefore making their work accessible to more people. For me, this is one of those books. The number of characters can be overwhelming at first, but Layland ensures that Keri Rose and Kimbria’s roles as the lead heroines shine through. Even though some parts are slightly slow, overall the plot lines are properly paced and this novella is written with clear-cut and vivid prose. I’m ambivalent about the arranged marriages aspect in the story, but it’s not a pressing issue in this fictional tale. 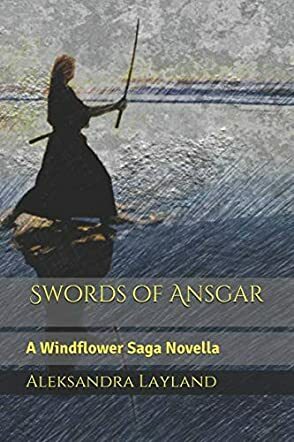 In a way, Swords of Ansgar is a perfect introduction to readers who haven’t read the Windflower Saga series, as both stories, particularly the story of Keridwen Rose, gives some significant background details regarding the main characters. On the whole, this is a good, light read from Layland and might lure new readers to the Windflower Saga. Swords of Ansgar is a novella in the Windflower Saga series of novels by Aleksandra Layland. It is short and to the point, only 86 pages, but fans of this series will love it because you get to see major and minor characters from different times in the saga. I like stories set in a medieval type setting. I like the focus on family and duty. I also am a fan of warfare in these time periods. Life seems more intense and to acquire a skill takes more time and dedication. In other words, a book like Swords of Ansgar is made for a guy like me. I liked Swords of Ansgar for a lot of reasons, but two things especially stand out. The first is the focus on family. So many stories about feudal families end up pitting father against son, brother against brother, brother against sister, etc. This is kind of sad to me, but I get that it is totally realistic and that is how it is sometimes. It was pleasant to read the opposite side of the story. A tale where the entire family pulls together. A tale where people end up accepting and being happy doing the job that fits their personality, regardless of whether or not they might lose rank. This can make a big difference in whether a family is happy or not and Aleksandra Layland makes it seem like a natural thing. A good plot, great characters, and a rich background to draw from make this a good novella.